Coalition for Truth and Justice on Monday said the promptness with which troops of the Nigerian army responded and repelled the Boko Haram attack in Gudumbali inspires hope and confidence in the Nigerian army and it's leadership to protect the country. The group in a statement signed by its national coordinator, Charles Timothy esq. said the troops did not just repel the terrorists but also regained control of the entire local government and its headquarters. According to him, the Gudumbali battle hold significant relevance because it is evident that the aim of the insurgents for attacking a military base can only be for one reason, to acquire more arms. He explained that this is further proof to the position of the Federal Government that the Boko Haram terrorists have been degraded and defeated and have lost most of their tools for terrorizing the civil populace, adding that this last desperate attempt cannot therefore be viewed from any other angle other than what it is, a desperate push to rebuild their base which has failed. According to him, that the terrorists are making attempt at a local government headquarters further supports the position of the federal government that they no longer control any local government in Nigeria. Timothy said but most importantly is the marked difference between how the troops have improved over time and their in reading resolve and commitment to the cause of securing our nation unlike what was obtainable in the past. He said, "in this particular instance, we have seen a military which once operated with a dampened moral that it fled from such attacks , now immediately regaining momentum, restrategising and plummeting the ranks of the attackers in the fraction of a second. "We have seen a military that is firmly rooted that it is no longer taken aback or wearied by irritable provocations. This can only possible with a troop that is not just high in moral but has been equipped with the right tools and weapons to prosecute such operations. This also is statement of confidence on the military high command." 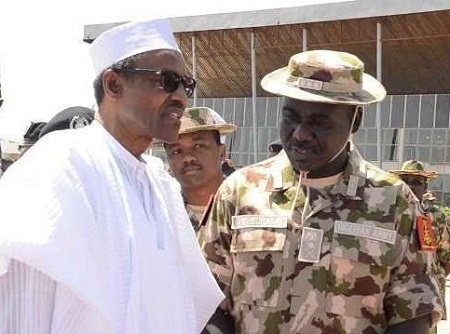 He however stressed that as the military continues to make sacrifices so that the territorial integrity of the nations remains intact and people are safe enough to go about their normal business, Nigerians must defeat the naysayers who want to cash in on any incident to ridicule our resolve to fly above fear and unnecessary panic. He said, "There was an instance recently when someone claimed there was bomb in Maiduguri whereas there was none. We must as a people come to terms with the fact that in our midst, are people who celebrate only the negative but are silent when the nation scores a point. "It is perhaps because of this that some have held unto the reports of the initial attack at Gulumbari but have completely ignored the counter force mobilized in the twinkle of an eye which sent the insurgents fleeing. "We commend the Nigerian military for rising to the occasion and we urge all citizens to continue to pray for the well-being and success of the troops as they are peopled by personnel who also have families and relations and feel pains like the rest of us."